I recently tried the Pledge Fabric Sweeper for Pet Hair for the first time. I have to say, I was pleasantly surprised (…though not 100% sold on the product on first glance). I’ve written about my frustrations with pet hair before, so I really like having yet another tool in my arsenal of dog fur removal items. I don’t know if it’s the end-all be-all to pet hair removal from furniture, but it’s close! If you’re a pet owner, then you know that it’s always nice when you have a quick & easy go-to method of removing pet hair from furniture. It’s especially handy to have a gadget like this when you’re expecting guests to arrive soon. My current method of pet hair removal from furniture is to use the same type of lint brushes you would typically use on clothes. 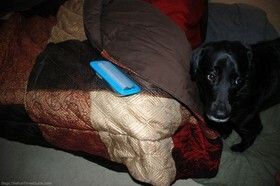 I have a couple that I don’t use on clothes… I only use them on the furniture to remove dog fur. 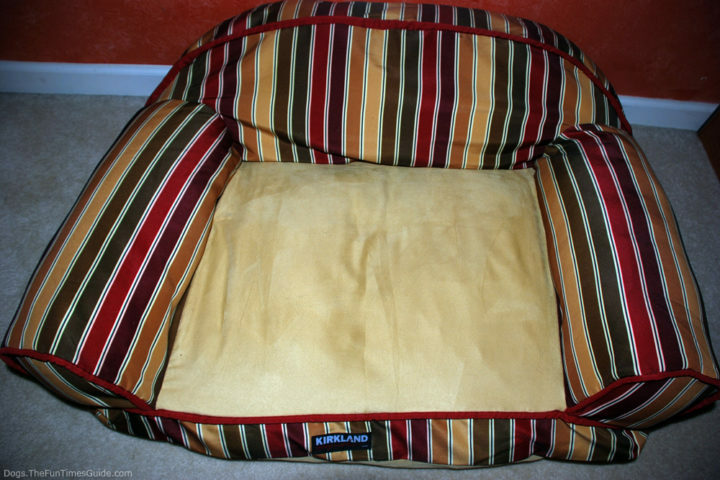 This is the same concept used with the Pledge Fabric Sweeper for Pet Hair. #1 – It’s lightweight and easy to use. There’s nothing to “learn” prior to using this pet hair remover. Even kids can do it! The thing that makes this gadget work so well at removing pet hair is the way it grabs the fur on rollers, and traps the pet hair inside. So, yes, they do recommend using short strokes in various directions, but that’s pretty easy to remember. #2 – There’s no motor, no sharp edges, no loud noises, no sticky residue, no chemicals. #3 – It’s quick and easy to use. The way the rollers are designed, it’s pretty much self-cleaning. 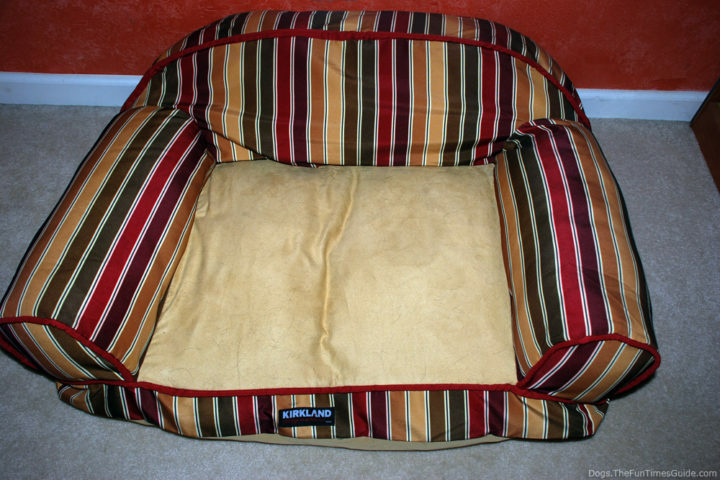 #4 – It removed my dog’s fur from his pet bed after just a few swipes. Pretty cool! I’ll definitely be using this pet hair remover on the “people” furniture before guests arrive in the future. NOTE: In these photos, it might appear that the Pledge Fabric Sweeper managed to remove all of the dog fur from the pet bed. But what’s harder to see are a few of the smaller hairs that it left behind. No matter how many times I’d go over the same spot, the short thin hairs seemed to just get pushed around on the pet bed. Works great on long pet hair though! #1 – It looks, well… cheap. This is kind of nit-picky, but the Pledge Fabric Sweeper for Pet Hair looks more like a “prototype” than an actual award-winning design, if you ask me. While it’s very lightweight and handy to grab and use in a jiffy, it’s definitely not very “classy” looking. I mean, compared to other cool pet gadgets, this one is rather cheap and plasticy looking. It’s not impressive on first glance, but it’s functional nonetheless. My guess is they’re waiting to see if this pet hair remover takes off or not before they invest in the design. Oh well, looks aren’t everything! #2 – It’s kind of expensive. You can usually find the Pledge Fabric Sweeper for Pet Hair at stores like Walmart and Target between $5 to $10. #3 – Mixed results on carpet. Still, it’s worth mentioning that this pet hair remover won’t work so well on carpet or pet items that are covered with carpet — such as cat climbing towers and doggie steps or ramps. On the flip side, I found that it works great on lamp shades! It removes the built-up dust and dog fur at the same time. I know, I wondered that too… how in the world does pet hair land in high up places like lampshades? Best I can tell, dog fur is airborne — much like a virus. Once you’ve got it, it’s hard to get rid of it, and it ends up in places you’d never dream of! One quick glance around my house confirms this. On first glance, you might think this pet hair remover could last a lifetime, because the rollers only come in contact with your furniture and the rollers themselves. So it seems a rather clean and self-contained contraption. In the end, the one thing that determines the life of this product is the amount of pet hair contained inside. Once it gets full (which for me, would be a long time), it’s done. For some reason, you can’t open it up to clean off the rollers yourself or remove the pet hair inside. It “looks” like you can, but you can’t; it’s sealed tight. Bummer, I would prefer a reusable pet hair remover that you could add new rollers to, after they wore out. UPDATE #1: It’s reusable… with a few tweaks. Here are step-by-step instructions for emptying the Pledge Fabric Sweeper. UPDATE #2: There’s now a fully reusable version! Thank goodness! They’ve finally removed all doubt (and frustration) for pet owners who’ve been hacking the original Pledge Fabric Sweeper for Pet Hair in order to make it disposable. There’s now a fully reusable Pledge Fabric Sweeper for Pet Hair that requires no special steps or instructions. A flick of the switch on the side of the sweeper opens and closes the lid. So, once and for all, the Pledge Fabric Sweeper is indeed reusable!